You can read our latest information here! Having driven my fair share of classic and modern cars, I’ve become rather complacent with the variations on the manual and automatic gearboxes most car manufacturers employ. Whilst there may be different configurations underneath, most feel familiar at the point of contact with you – the driver – and the average driver wouldn’t even know whether their gearbox is a synchromesh, CVT or dual-clutch system. Before these types of automotive gearbox became commonplace, there was another type of manual gearbox known as the ‘pre-selector gearbox’, or ‘self changing gearbox’. 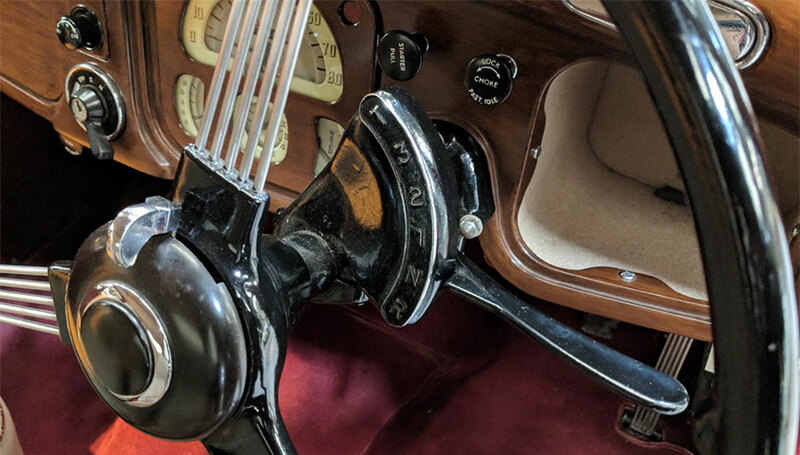 I recently had my first experience driving a car with a pre-selector gearbox – a Lanchester LD10, and whilst it wouldn’t be my box of choice, it has been an interesting exercise in appreciating another part of automotive mechanical progression. The Daimler ‘self changing gearbox’ and fluid flywheel found in the Lanchester LD10 is somewhat of a stepping stone between a manual and fully automatic gearbox. The same system is found in many pre-1950s Daimler, Lanchester and BSA cars and is lauded by many as an excellent system. In reality, it’s not the best choice for modern-day driving in traffic and on congested roads, but it certainly has its charm. Rather than the usual floor-mounted gear stick, the gear selector is mounted on the steering column, and easily slides into positions 1 2 3 and T (for top). There is no inhibitor switch in the pre-selector gearbox, meaning that the starter motor can be engaged in any gear, meaning it is essential to always ensure that the car is in neutral before starting the engine. Gold Wedding Cars provide luxury wedding car hire to suit all tastes and budgets.